There are plenty of interesting things to look at in Nazlini. There are the candy-striped badlands of Beautiful Valley, strewn with logs of petrified wood. There are the ruins of Three Turkeys Tribal Park, and the eerie black tower of Fluted Rock. There are deer, bear, mountain lion, badger, and even, according to Community Services Coordinator Judy Donaldson, a lynx. If you're not afraid of the ghosts who whisper in the cave, you can hike along the wash to a pocket in the rock painted with exquisite, tiny pictographs. But it seems that in this beautiful, variegated chapter, all eyes are trained on the lists. And the lists are fickle. First and foremost is the list of BIA roads to be paved. 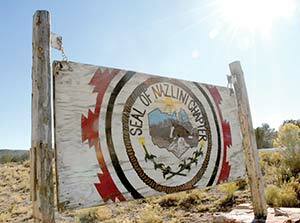 A few years ago, Navajo Route 27, Nazlini's lifeline to the outside world, finally drifted to the top of that list. The pavement started, and came within 10 miles of Chinle when -- bam! -- N27 slipped back to Number 35, and the construction crews pulled up stakes and left. "Politics," spat Donaldson. "That's the polite way of putting it." The list, it seems, is at the mercy of whoever is on the BIA's road priority committee at the time. This is not Nazlini's year, and it hasn't been for a while. However, another catalog -- Navajo Nation Oil and Gas Company's ranking of priority locations for its next convenience store -- seems to be listing in Nazlini's direction. "First was Shonto, then the second was supposed to be Dennehotso, and we were third," explained Chapter President Johnson Claw. "But when they approached Dennehotso, they weren't ready, so they moved us up to second." This will be a very good thing for Nazlini. Ever since its trading post closed in 2002, "If you feel like a can of pop, you have to drive 19 miles to Ganado or 22 miles to Chinle," Donaldson said. Until recently that was the case with the post office too. According to Claw, the trading post had also held the community's post office. The owner, he said, closed up shop with one day's notice. "Everybody was saying, 'Where will the mail go now? How am I supposed to get my check?'" Claw recalled. Again, Nazlinians were forced to choose between Ganado or Chinle, when the chapter decided to take things into its own hands. With the tribe acting as mediator between the chapter and the federal government, Nazlini purchased a used prefab building and just last month set up its own U.S. post office to government standards. "It's not the government's post office," Claw said proudly, "it's ours. The U.S. Postal Service did not put a cent into that building." It did, however, hire a postmistress. She's only half-time, but no matter; Nazlinians are just grateful to be able to check their mail without driving for a half-hour. Once the road is paved, Claw insists, "Good things will happen in Nazlini." But unlike the post office, Nazlini can't make that happen by itself. That's up to the list. Claw remembers his grandfather talking about the road when Claw was about 5. "He said, 'You know what?'" Claw recalled. "They're going to build an all-weather road all the way to Chinle." Cheii didn't live to see it, and Claw recalls his parents talking, at some later time, like the road was once again imminent. "Now it's into the third generation," the chapter president said. "I'm going to see that road one of these days." As tired as it is of waiting on lists, you'd think little Nazlini would be pursuing local governance certification. But Claw is not a fan of the Local Governance Act. Not only is he not pursuing it for Nazlini, he is not looking forward to the day Chinle and Pi–on complete their certification and start collecting their own taxes. "They're going to take a lot of money from us," Claw opined. Currently, he said, sales taxes from businesses in Central Agency are shared among all the agency chapters -- Nazlini got $67,000 this year. It's fair, he says, because Nazlinians shop in Chinle. Because Nazlini is small and off the beaten track, it will never attract businesses the way Chinle does, and it's not fair to expect it to, he says. One industry Nazlini can and probably should revive, Claw says, is agriculture. "We used to be known for our apples, apricots and peaches," he said. "People would take them over to the trading post to trade for other things." Nazlini is in the process of repairing its network of irrigation canals and dams in order to encourage people to farm again. About 85 percent of Nazlini families have running water, and the chapter is now working with the Office of Environmental Health and the Indian Health Service on running a pipeline to the Three Turkeys area -- which will be extremely problematic since many homes there are built on bare rock. "But we'll get it done," promised Claw. The majority of chapter residents have electricity as well; the next priority will be extending the electric lines. As much as Nazlinians hate lists, they're a necessary evil, and Claw, who took office in January, is still in the process of working with the chapter administration to set the chapter's own priorities. One thing Nazlini does have is a BIE grant school, as well as a Head Start with a certified teacher. Ganado and Chinle unified school districts overlap here, and parents may choose which secondary schools their children attend. The active senior citizens center even has a Meals on Wheels program for homebound elders. "We watch out for our younger ones and our older ones," said Donaldson, "since that's the bulk of our population." In fact, watching out for each other is a Nazlini tradition. If an elder is having trouble filling out the paperwork for a home weatherization, Donaldson thinks nothing of driving out to her house to lend her a hand. If a student is hanging out using the chapter's wifi to finish a homework assignment, "I'm not going to tell them, 'Too bad, the chapter closes at 5,'" she said. "I'll keep it open for them." After all, she reasons, "They're probably my relative."